Nearly two months before ballots are cast, Chief Cabinet Secretary Shinzo Abe - a proponent of an assertive security policy and traditional values - looks unbeatable in the race to be Japan's next leader. Pressure, however, appears to be mounting on the conservative political blueblood not to visit Yasukuni Shrine, seen elsewhere in Asia as a symbol of Japan's past militarism, if he wins. Prime Minister Junichiro Koizumi's pilgrimages to Yasukuni have damaged ties with China and South Korea since he took office in 2001 and began his annual visits. Abe, known for talking tough on North Korea and China, has long topped the list of preferred candidates in polls of voters. A decision not to run by his closest rival, veteran lawmaker Yasuo Fukuda - an advocate of better ties with Beijing and Seoul - has firmed up Abe's chances of victory, analysts said. 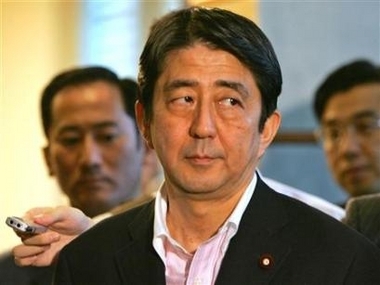 Two surveys published on Monday showed Abe way out in front of remaining unofficial candidates, garnering a 44 percent support rate in a July 23-24 poll by the Mainichi Shimbun and 42 percent in a survey by financial daily Nihon Keizai Shimbun. Fukuda was still number two despite bowing out, but won only 11 percent support in the Mainichi poll and 12 percent in the Nihon Keizai survey, down several points from earlier ratings. Foreign Minister Taro Aso, another hawkish candidate, won support from 7 percent of the respondents to the Mainichi poll while Finance Minister Sadakazu Tanigaki gleaned just 3 percent. "Of course, if a scandal or something emerges that's different, but right now it looks like Abe," said Keio University political science professor Yasunori Sone. Japan's dominant ruling Liberal Democratic Party (LDP) will choose its next president in September when Koizumi's term ends and the victor is virtually assured the prime minister's seat as the party controls parliament's powerful lower house. Fukuda, 70, cited his age and falling support rates among his reasons for deciding not to run. A former chief cabinet minister, Fukuda had support not only from those unhappy with Koizumi's Asian diplomacy but also those opposed to his economic reforms, and lawmakers loathe to see the leadership pass to a new generation represented by Abe who is 51. Keio's Sone said it was hard to see another candidate winning support from all three groups, although media have speculated they might coalesce around Economics Minister Kaoru Yosano, 67. "The race inside the LDP appears to be over," he said. Defence Minister Fukushiro Nukaga's name has also been floated, and LDP heavyweight Toranosuke Katayama said on Monday his party faction would decide next month whether to back him. LDP members of parliament are eager to have a popular leader who will improve their chances in an election for the upper house next summer, and many think Abe fits the bill. LDP lawmaker Taro Kono, 43, also gleaned 3 percent in the Mainichi poll, while former LDP policy chief Taku Yamasaki, 69, has said he would decide whether to run late next month but at present has only a scant 1 percent support rating with voters. Abe's unofficial campaign moves into high gear this week with appearances to tout his "Second Chance" policy aimed at ensuring that market-based economic reforms begun under Koizumi do not result in a society of permanent "winners" and "losers". But he looks likely to face a dilemma over a topic of keen interest to Seoul and Beijing -- pilgrimages to Yasukuni. Both the Mainichi and Nihon Keizai surveys showed a majority of voters now oppose visits by the prime minister to the shrine. Abe has supported Koizumi's right to pay his respects at Yasukuni and last year visited the shrine on the emotive August 15 anniversary of Japan's surrender in World War Two, but has not made clear whether he would go there if he became top leader.